Imagine that you are watching Netflix on your brand new Galaxy Note 7. Now you do not want the device to run out of battery while you are using it so you keep it on the charger. Soon you begin to notice that the phone is beginning to get very warm. You just think its because you have been watching movies for a while. soon enough you start to smell burning and your new tablet catches on fire. This is a problem that many Galaxy not users have experienced recently. There was a defect in many of Samsung products batteries that caused the phone to explode. 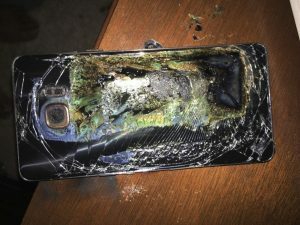 Even though this is a problem Samsung handled it very well. They recalled the product before the government required them to do so. Not only that but they also put together great programs to refund their customers. You could return your tablet and get another one for no charge. You could get a complete refund, and you can get any other Samsung phone, and they would pay back the difference. This shows Samsung practicing good Global corporate citizenship. They took responsibility for their mistake right away. What do you guys think? Is there anything else you think Samsung should have done to fix this?